A little while ago, we were asked to explore and review the services and website offered by Borrow My Doggy! What is Borrow My Doggy? 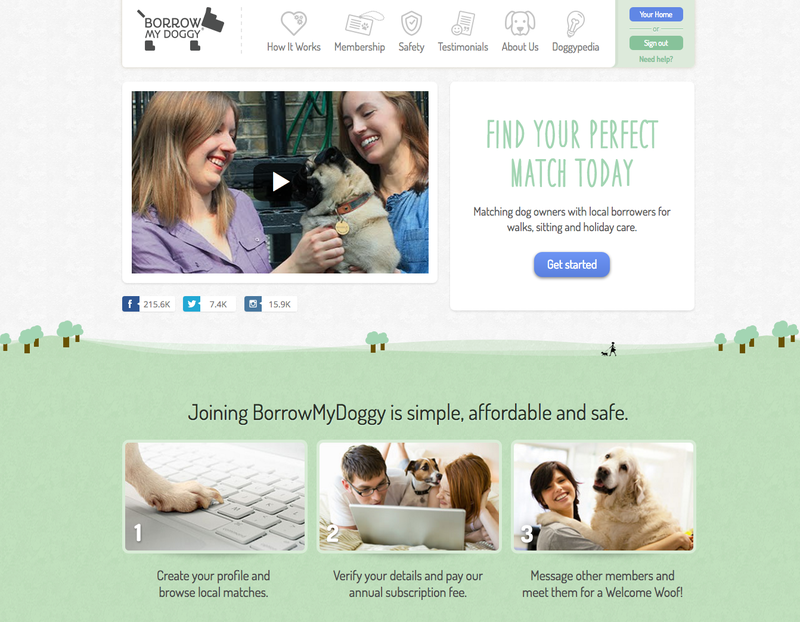 Borrow My Doggy is effectively an online community with over 300,000 members, established since 2012, for dog owners to connect with "borrowers" - essentially dog lovers who perhaps can't or don't currently have a dog of their own, and want to be able to connect with dogs for walks, playtime or just some fuss and attention! It pretty much works like a dating app - borrowers and owners can view local profiles of people in their area, they can directly message each other and strike up communication through the website. There is also a mobile app which we also had a play with. 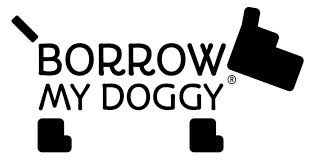 The website is very easy to navigate and has a friendly "persona" - the ethos of Borrow My Doggy is to leave "Pawprints of Happiness" on the lives of owners and borrowers, to build relationships and to help provide help without payment to dog owners. Anyone can set up a free profile and have a browse, but if you want to contact anyone and become a verified member, there is a membership fee. Currently owners pay £44.99 a year, and borrowers a mere £9.99 a year. The membership fee includes verification (onto that in a moment), third party liability insurance as long as both the borrower and owner are full members, and a 24/7 vet hotline for both parties. The verification process is a multi step process, including providing providing full address and telephone number details, providing verification of such and meeting face to face (which Borrow My Doggy call the "Welcome Woof". There is also the option to upload a verification video, which we did at the app stage. The app itself is currently only available for the iPhone, but would hope that this will eventually rolled out to Android. Luckily, I have an iPhone! It is a fairly simple and easy to navigate app, and does make messaging borrowers and owners a little more like sending a normal text message Upon downloading the app, I also had to upload a short clear video, stating my name along with some other details. One thing we were unsure of is if those videos are reviewed for legitimacy. So did you meet anyone? We actually met a couple of people off Borrow My Doggy, to get a good idea of a borrowers experiences. It took a little time to sort out with all the disgusting wet weather we have had recently, so invited them to our home, with the option of a walk should it have stayed sunny! The first lady we met was Lisa, a lovely lady who lives not that far from us (you can sort borrowers by distance, and also handily can see how active they have been on the site). Lisa initially joined Borrow My Doggy as a dog owner, when she was looking to find a borrower who could help her when her spaniel was diagnosed with pancreatitis, by popping in and letting her out. However, within a couple of weeks her spaniel was with her parents as needed full time care, and Lisa changed over to the Borrower side, as she missed her dog terribly, along with the beautiful countryside walks, which aren't always nice for a female lone walker. Lisa has had some positive experiences through the site, although has noted that there are a proportion of dog owners who see it is an easy way of getting their dogs exercise needs tended to without having to walk them themselves. However, she did gain a great trusting friendship, helping a dog owner who genuinely wanted help with a rescue poodle, leading to a vast improvement with the dogs issues (from a very sad history as a rescue) and rewarding all round. Lottie enjoying her cuddles with Lisa! 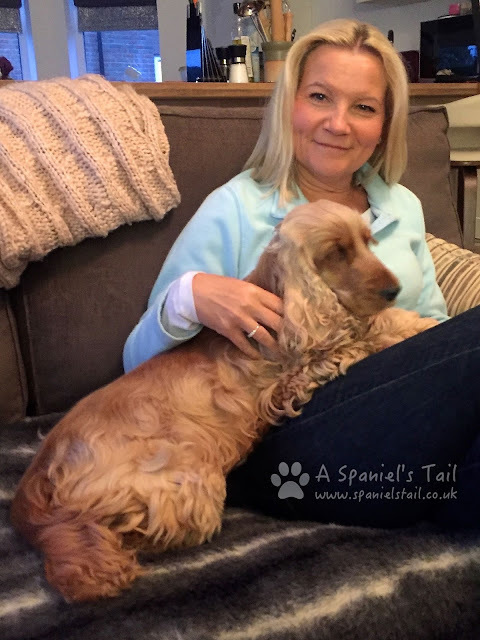 Carly is another lovely lady and Lottie had another load of cuddles, but we were the first ones she had met off the website, as she has not been that successful in finding people. Carly loves dogs and grew up with German Shepherds, but has a cat that doesn't tolerate dogs, so can't have one herself currently, so she joined purely because of her love of doggies! As with Lisa, it would be lovely to meet up with her again to go on a nice walk and for Lottie to show off her exemplary skills in finding disgusting things to roll in! This changeable weather didn't make it too easy to set up walks!! 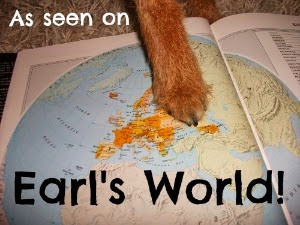 As with any online community and looking at Carly's experience, it tends to be luck of the draw of who has registered in your local area but that is not a fault of Borrow My Doggy, just logistics! One suggestion Carly had was refining the "Activity" status bar - at the moment it gives you a general activity level - very, fairly, rarely active etc, whereas she felt knowing how long ago someone was last active would be far more useful. 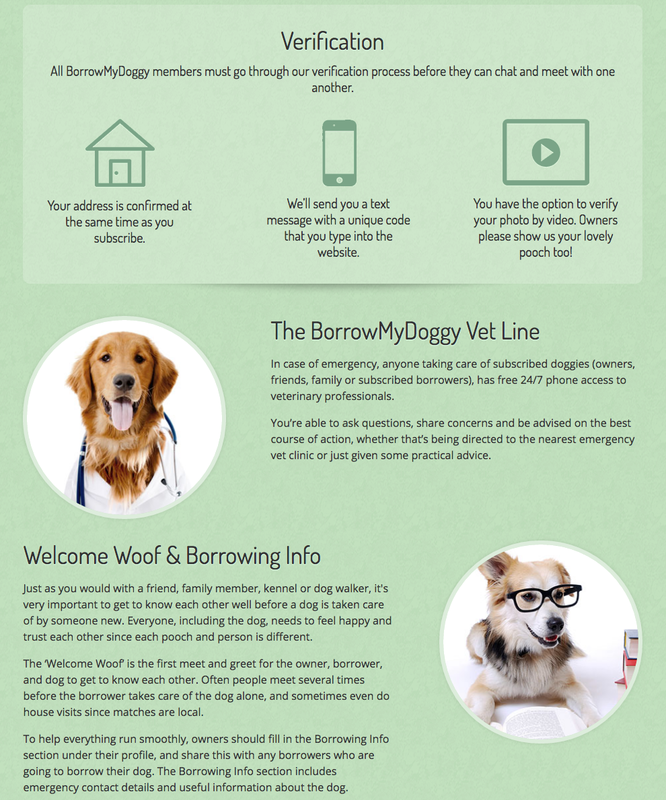 The premise of Borrow My Doggy is an interesting one, and has some potentially great benefits for both dog owners and borrowers. I can from a dog owners perspective see how it won't appeal to all - our fur babies are such a part of our lives, that the thought of handing them over to a stranger can be a prospect that many won't contemplate. My opinion? I think it is like any other new friends you may meet - find out as much information about them as you can, be cautious about who you are meeting (I did liken it to a dating app! ), and don't trust anyone with your dog until you are 100% sure that they can be trusted. We very much enjoyed meeting our two borrowers, and while I am not personally looking for anyone to care for Lottie, I would very much like to stay in touch with them both and we have talked about going on nice long walks with Lottie. And perhaps that is where I see it working for me - meeting new doggy-minded friends who would like to go on nice walks / outings with a dog owner and their dog, rather than handing over care. Personally I also think it would be awesome if there was an option for dog owners to connect with other dog owners to also make dog walking friends, or even group walks set up for both dog walkers and borrowers to attend (group walks are fantastic ways of getting chatting to people!). 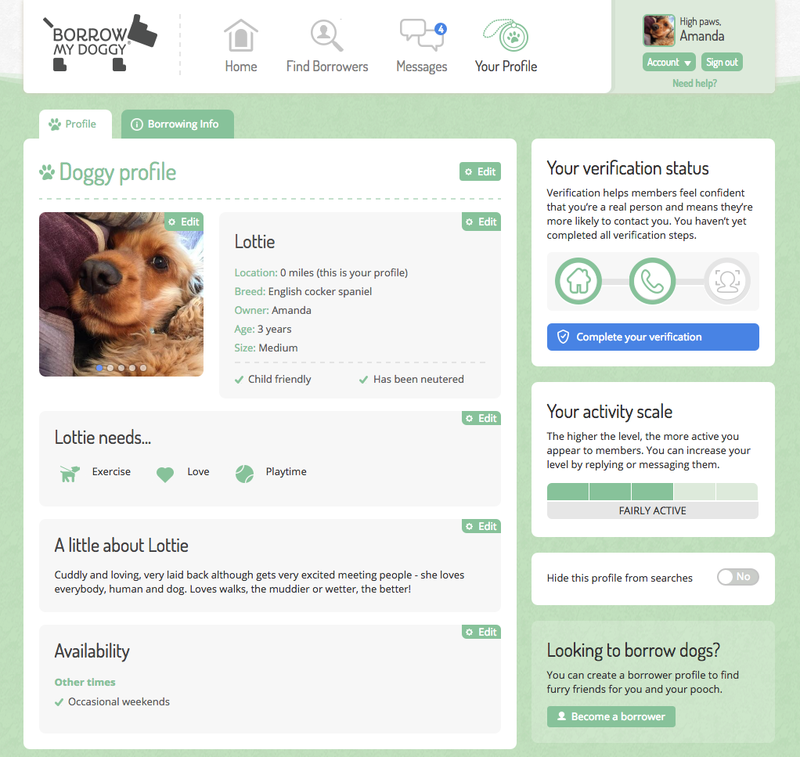 However, a registered dog owner can still create a free borrower profile to be able to browse local dog owners, should they wish to meet up with other dog owners. The only other thing I would perhaps comment on is the membership fee of £44.99 a year - tying in a dog owner for a whole year seems quite steep, and perhaps a monthly instalment (even a slightly more expensive one if paying monthly) would be a good option. However, Borrow My Doggy do offer a 3 month money back guarantee, should you have not met a match in that time. Overall it has been a positive experience for us, and we have enjoyed chatting to a couple of borrowers, who we will be keeping in touch with. Like anything else in life, just be careful. So if you are wanting to meet up with dog owners or borrowers in your area, click here to set up a free profile and have a browse - you never know, you may find your perfect doggy match! 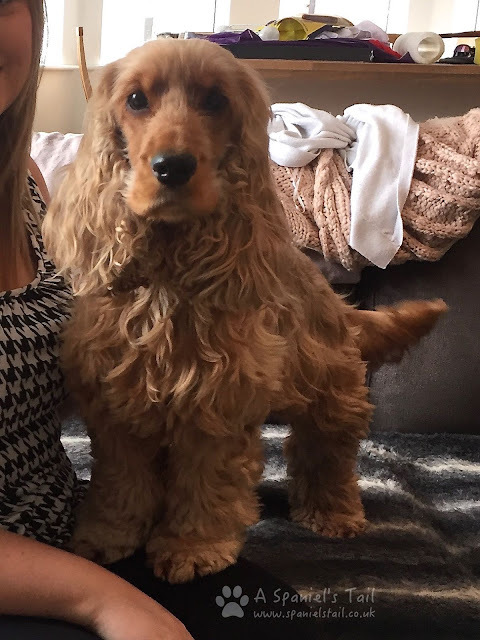 Membership to Borrow My Doggy was provided - however this is a full and honest review! Hi Lottie! It's always great to hear from you. When we read this post, we immediately thought about our Jessy human's wedding next February. Every member of our family will be traveling to Florida to attend, and we doggies will have to stay at a kennel. At Joey's age—he'll be 15 by then!—we worry about stressing him out at a strange place. But if we had a borrow buddy, perhaps we could doggie sit for each other. That's an interesting idea - I hopped over to their website out of sheer curiosity and browsed around a little. It looks like it's only designed for the UK though - is that right? It was a pleasure meeting Lottie and thank you for asking me to take part in your study. I have been on the 'Borrow my doggy' site for a few years both as an owner and borrower. I would be sceptical trusting my dog with a stranger. My dogs meant the world to me and a lot of invested effort is paramount in getting to know your borrower (afterall you have invested the same to your dog and you owe it to him/her to provide the best possible care) to gain an understanding of how you wish your dog to be looked after, share common commands, habits and do's and don'ts etc. However being a borrower also means having trust in the owner and forming a good relationship. Last thing a borrower needs is someone blaming them for something they had no clue about that might have been intentionally hidden. Borrowers should remember they are being entrusted with the most precious gift of an owners life - which is why I was appalled at meeting some owners who were happy to palm off their dog without establishing any common ground, seeing my home, getting to know me, least of all without letting me form a relationship in short stints first. I guess overall the key is to ensure you're happy with the relationship. In addition to the general feeling of the profile, ask for references, other owners who have used the borrower, ask what they do for a living etc, check out each others environments. Find out how they treated their own dog. Would they be happy to have your dog after you've been honest with them about his/her bad habits, whether they would tether your dog outside a shop unattended, leave your dog in a car, let it off a lead, nearest vet, giving of treats status, how they would treat your dog on a walk if it did something it shouldn't (you don't want them beating your dog! A groomer I used once beat my dog, hence I learnt dog grooming myself!)... that kind of thing! If you're not comfortable - don't do it. You have such a cute pup! Thanks for the share! Thank you so very much for giving permission. You can see your linked header under All, Pets and the United Kingdom. If you could say something (preferably good) about SiteHoundSniffs.com here and there, I would greatly appreciate it. I had a very poor experience of Borrow my doggy.... Had to pay lots for the 12 months subscription. Most potential borrowers did not respond or were not looking anymore. I finally managed two welcome woofs that were unsuccessful. Borrowmydoggy was very happy to cancel my account after three weeks and keep the signing up fee £ 9.99 and the etra 12 month subscription of £ 44.99 to be able to contact people, when I said it is not working out and I simply don't have time. Just stumbled across your blog and have been reading through! Really enjoying it..Do you still blog?